Curtin & Heefner along with the Bucks County Bar Association celebrates attorneys recognized by The Bucks County Herald “Lawyers Among Us” awards! The awards recognize lawyers who exemplify the highest standards of commitment and contribution to the community and the profession. Jordan Yeager chairs Curtin & Heefner’s Public Sector and Environmental practice groups. He represents local governments, environmental organizations, individuals, and community groups facing complex zoning and permitting issues. He was recognized for his intellect, creative advocacy and success in groundbreaking cases. His work has been credited with fundamentally revolutionizing environmental law in Pennsylvania, with ripple effects around the nation. Yeager has been practicing law for 25 years. Prior to 2008, when he turned his focus to environmental, land use, and municipal law, Yeager had established a reputation as a highly skilled litigator. 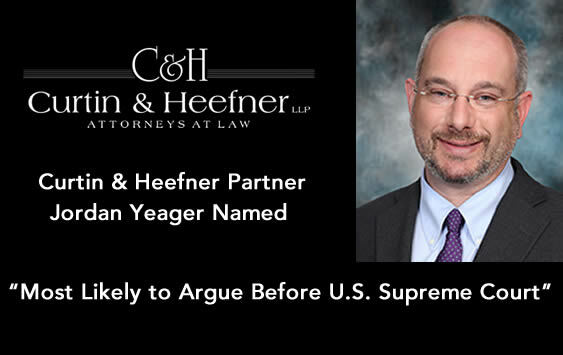 Earlier in his career, Yeager gained broad experience over a range of practice areas, including military law, family law, criminal and civil litigation, labor and employment law. Yeager is the recipient of the Florence Neilson Environmental Leadership Award, is regularly honored as a Pennsylvania Super Lawyer, and has been a frequent lecturer and published author.